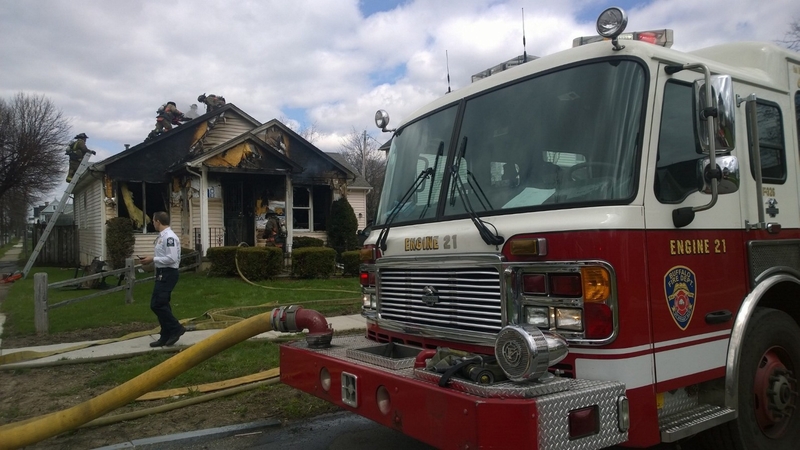 Buffalo firefighters battled fires in a house and garage on Glenwood Avenue Friday afternoon. The blaze left the front of the one-story house severely charred and the inside appeared to be heavily damaged. Firefighters remained at the scene for hours examining debris. Three firefighters suffered burns, bruises and smoke inhalation while battling what appeared to be intentionally set fires Friday afternoon in a house and garage on the 200 block of Glenwood Avenue. Police said a woman in her 50s was taken from the fire and was in very serious condition at a local hospital, though it initially was not known how she was injured. An older man came out of the house after the fire started and collapsed. Initial reports said that a woman at the residence stabbed as many as three Buffalo firefighters, but investigators have now determined their injuries were suffered fighting the blaze. The blaze was reported shortly after 1 p.m. in the one-story residence. Homicide and evidence unit detectives were summoned to the scene. Fire Commissioner Garnell W. Whitfield Jr. said two of the injured firefighters were treated for non-life-threatening burns and the third firefighter was treated for smoke inhalation. Dominique Jones, who lives two doors away from the burned-out one-story house, said she had never seen the lady who was burned in the house and only occasionally saw the older man who lived there. “That house was really quiet but one time the older man came out and helped me shovel snow off my car,” Jones said. Cynthia Johnson, who lives across the street near two vacant lots where houses had been torn down some time ago, said the older man came out the front door after the fire began, grabbed onto a fence next to the house and collapsed. He also was taken to a hospital by ambulance. She said the woman appeared to be badly burned. The burned-out house is at the corner of Glenwood Avenue and Waverly Street, a short block away from the intersection of Glenwood and Purdy Street where the Christ Crusader Assembly Church and the State Tabernacle of the Church of God in Christ are on opposite corners. Buffalo firefighters remained at the scene for hours examining debris. The front of the one-story house was severely charred and the inside appeared to be heavily burned. When firefighters first arrived, they reportedly saw two lawn mowers on fire outside. The injured woman reportedly broke some of the front windows, which fanned the flames.